Vincent went out of his way to make sure we had everything we needed and he was kind enough to allow us to check in early. The apartment (two separate buildings divided by the outdoor pool area) is a great space for a large group or family. The bedrooms in the living area beyond the pool did get quiet warm during the day but were fine at night with the fan.The outdoor pool area between the two buildings was the perfect place to hang out on a hot afternoon. Although on arrival, it didn't seem like there were many shops in the neighborhood, we found a street just two blocks away that had everything we needed (bakery, cheese shop, market and a great restaurant). The apartment is just a 10 minute walk to the tram and a 5 minute walk to the bus stop which made it really easy to get in and out of Bordeaux. We had a wonderful time! We have just arrived home after a lovely weeks stay at this property-3 families which included 6 adults and 3 children/toddlers,1 baby. Loads of space and sleeping arrangements are flexible depending on the party. The house consists of a main ground floor apartment with 2 double bedrooms and then a separate chalet/summer house at the bottom of the garden with a double bedroom and another bedroom with 3 single beds. There is also a sofa bed in the main apartment living room and another single bed here if required! The outdoor space was fantastic-a total sun trap and we enjoyed eating all our meals here-including a number of BBQs! 10 minute walk to a tram stop for access into bordeaux which was great! Nearest supermarket about 5minutes walk too which was very convenient. The pool was great and much bigger than it looks in the pictures and was perfect for our 3 toddlers aged 2-3! They loved it! We enjoyed the terrace in the evening for a few drinks once the kids were in bed. It was very hot weather when we were there and the house didn’t have aircon so it did get quite hot overnight! Would Recommend making sure all windows opened during the day to cool the place down! Overall a great stay and our host Vincent was so friendly and accommodating-he bought a new high chair and travel cot for the baby in the party which was greatly appreciated! We had a great holiday and would recommend this property. Vincent is a good host and the garden and pool are a joy with small kids, but the house is musty and in need of a professional clean. Mugs are chipped, utensils old, oven problematic. Also, after a long flight and arriving at 10.30 in the evening I was surprised we had to make our own beds on arrival. Lovely apartment that easily accommodated nine of us. 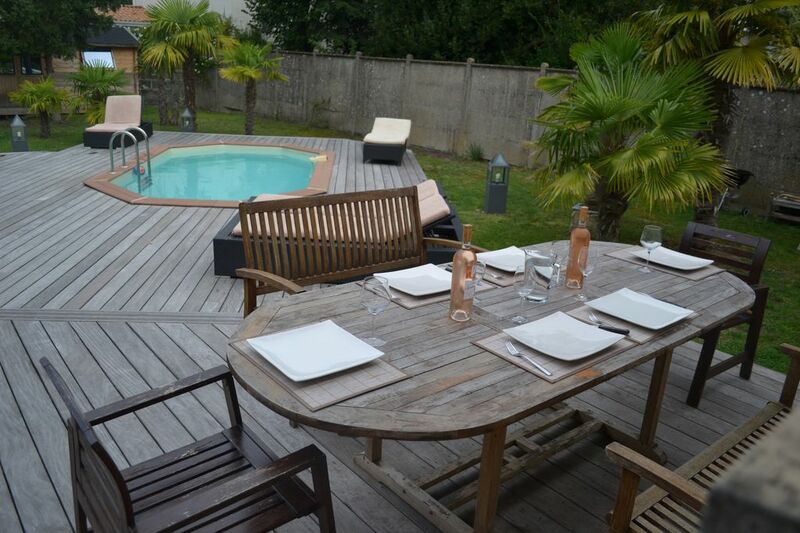 Very close to the centre of Bordeaux - within walking distance and also close to trams and buses. Pool area is spacious and comfortable . We all sat outside in the evening for meals and enjoyed the warm summer night. Vincent is a fantastic host and extremely helpful in explaining where everything was . We would highly recommend this property . Great location, great house, fabulous garden and super pool. The owner was very friendly and more than helpful.